International Conference for Sustainable Infrastructure (ICSI), Shenzhen, China, 2016. Climate Change and Cities: Summary for City Leaders at COP21 Climate Summit, 2016. Paris COP21 at the NY Center for Architecture, 2016. Panel: The Road from Paris, Pratt 2016. Conference: Design Solutions for Climate Change in Urban Areas, Naples, Italy, 2016. Publication: Climate Change and Cities: Summary for City Leaders at COP21 Climate Summit, 2016. Hot Cities Conferences at the NY Center for Architecture, 2016. ASLA-APA-AIA Annual Conference: Seeds of Urban Transformation - How Policy, Planning & Design Shape new York Neighborhoods; South Bronx Case Study, 2016. Elected to the College of Fellows of the American Institute of Architects, February 2015. Lectures in Beijing and Shanghai, China: Tongji University College of Architecture and Urban Planning (CAUP) and Beijing University for Civil Engineering and Architecture (BUCEA), 2014. Naples, Italy conference: Design Solutions for Climate Change in Urban AreasElected to the College of Fellows of the American Institute of Architects, February 2015.Lectures in Beijing and Shanghai, China: Tongji University College of Architecture and Urban Planning (CAUP) and Beijing University for Civil Engineering and Architecture (BUCEA), 2014. Advisory Committee member to develop the EcoDistricts Global Protocol, 2014-present. Expert: National Science Foundation (NSF) - Urban Climate Institute (UCI), Atlanta, 2014. Lecture in India: The Challenges of Mumbai as a Mega-City, European Union-Bombay First, 2013. Expert: Project East: Euro-Asia Sustainable Towns, Qingpu, Shanghai, China, July 2013. Directed Sustainable Urban Design Workshop at Xiamen University, Xiamen, China, Summer 2013. Juror: Shaping a New Capital City to Fit Indian Life, ENTP-EAST European Union-sponsored urban design workshop, India, 2012. Lecture: Resilient Cities, Cambridge University, England, 2012. Lecture: China International Urbanization Forum, National Development & Reform Commission - China Center for Urban Development, Shanghai, 2012. Steering Committee: US Environmental Protection Administration (EPA), Global Change Research Program (GCRP) for Urban Resilience, 2012. Lecture: The Humboldt Foundation, Germany, 2012. 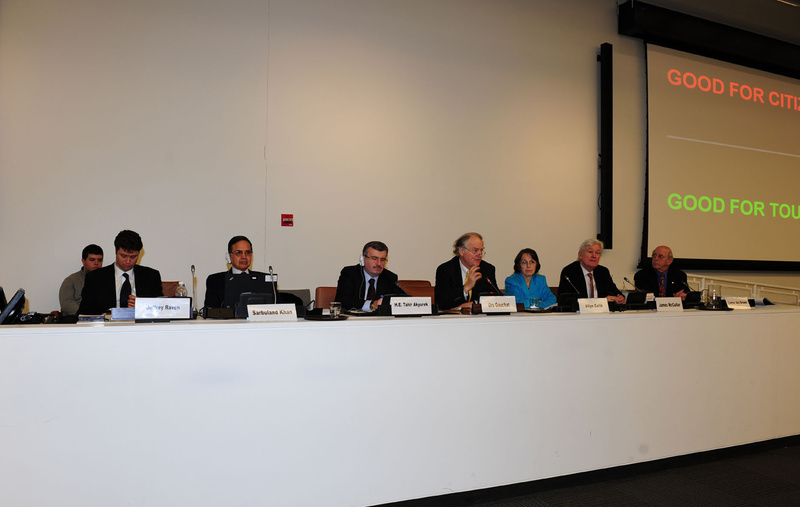 Lecture: UN Habitat + Consortium for Sustainable Urbanization, United Nations, New York, 2012. Workshop: UNDP Europe and the CIS, Bratislava Regional Centre, Slovakia, 2012. Lecture: CIPSEM-UNEP, International Post-Graduate Training Programme, Germany, 2012. Published: Cooling the Public Realm: Climate-Resilient Urban Design, Resilient Cities (Springer 2011). Published: Royal Town Planning Institute (UK): Vietnam Climate-Resilient Urban Design project, September 2011. Cities, Prince of Wales' Business & Sustainability Programme and China Mobile - Cambridge Programme for Sustainability Leadership, Cambridge University, England. Interview and presentation at Global Forum on Urbanization + Health, Kobe, Japan. Cooling the Public Realm:Climate-Resilient Urban Design paper linked by US Green Building Council as Research Publication selection on www.usgbc.org. Consultation and presentation on Energy Efficiency + Cities: Livable and Sustainable Cities in Asia at Asian Development Bank Urban Day, Manila, The Philippines. Presentation on Planning + Design for Resilient Communities at The World Bank, Washington DC. Institutions and experts gather for Regen: NJ Highlands, a regenerative design conference. Jeffrey Raven presented on green infrastructure performance frameworks. Policymakers and experts gather for First World Congress on Resilient Cities in Bonn, Germany. Jeffrey Raven delivers a lecture on Climate-Resilient Urban Design. Business, civic, professional and government leaders gather for RPA's 2010 Regional Assembly in NYC. Jeffrey Raven a panelist for Building a Green Infrastructure".